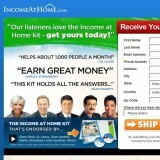 Income At Home from Centurion Media Group found at incomeathome.com is an online business lead capture page system used to market an MLM business called Herbalife, most well known from it’s radio advertising. To get more information about Herbalife (they of course don’t tell you up front that the business opportunity they are talking about is Herbalife) the “business opportunity”, they charge almost ten dollars for it. You can easily research Herbalife online and get tons of info for free. You can go to their meetings where there are people who can sponsor you and share their experience in Herbalife with you. Herbalife has its share of pros and cons, but for the purposes of this review, I’m addressing this particular marketing business, “Income At Home”. Built to generate leads for Herbalife, Centurion Media Group through “Income At Home” essentially works on a bait and switch business model. It is wholly designed to drive traffic in and generate leads. At $9.95, including shipping and handling, ‘Income At Home’ offers a DVD/booklet packet that amounts to generic brochure with info about health products and why you should be in a home business. If you do sign up for Income At Home and forget to cancel their “services” within 14 days, you will get automatically billed $39.95! This is over double the cost they charge for each lead – about $15 per – which means you pay their advertising expense and earn them a small profit. Soon after you have paid for their info packet, a salesperson will contact you to talk about Herbalife. Now, Herbalife is another issue entirely, as a few ever make substantial money. Most will never break-even on their investment. The amount of time, effort and money one puts into it is likely not commensurate. However, the tactic which Income At Home is using to get people to pay for something already readily available for free anywhere you look online is not, in my opinion, a very ethical one. If you are interested in starting up an MLM business with Herbalife (not recommended), I suggest you avoid Income At Home from Centurion Media Group and go straight to the source.